Inside the Arlington - The Largest Hotel in Arkansas. Hot Springs is known as one of Arkansas's most popular tourist destinations. Nestled in between the Diamond Lakes, speckled with a plethora of grand, fun and friendly attractions, dotted with great shopping opportunities and blessed with world-famous thermal bathing, the Spa City is a top choice for travelers looking for the right place to kick back and relax. 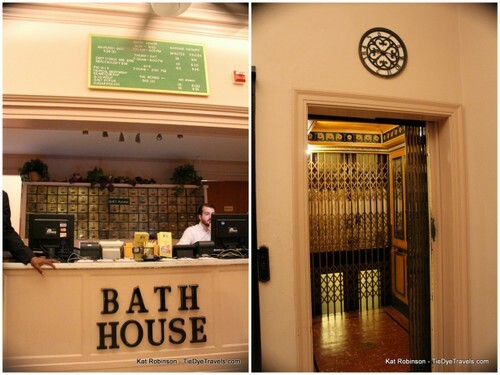 The city's most famous accommodations can be found within an edifice overlooking the famed Hot Springs Bathhouse Row. The Arlington Hotel and Spa offers 484 rooms with all sorts of amenities, from large historic parlors to thermal water piped bathrooms to a series of suites named after the celebrities who stayed within. There's a traditional spa within that utilizes the thermal waters, and a double decker pool out back. Let's take a tour! boasted 300 rooms on five levels. This particular Arlington burned in 1923.
renovated, but still maintains its original glory. will set up to play. The acoustics are ridiculous... in a good way. plenty of comfortable sections for conversation and good seats for people watching. This is the Lobby Bar. It's famous. It's so famous, Esquire Magazine named it one of the top barsin the entire nation. There's also a self-serve popcorn machine and watering stand right next to the Lobby Bar. Don't feel guilty. Get a cupful. 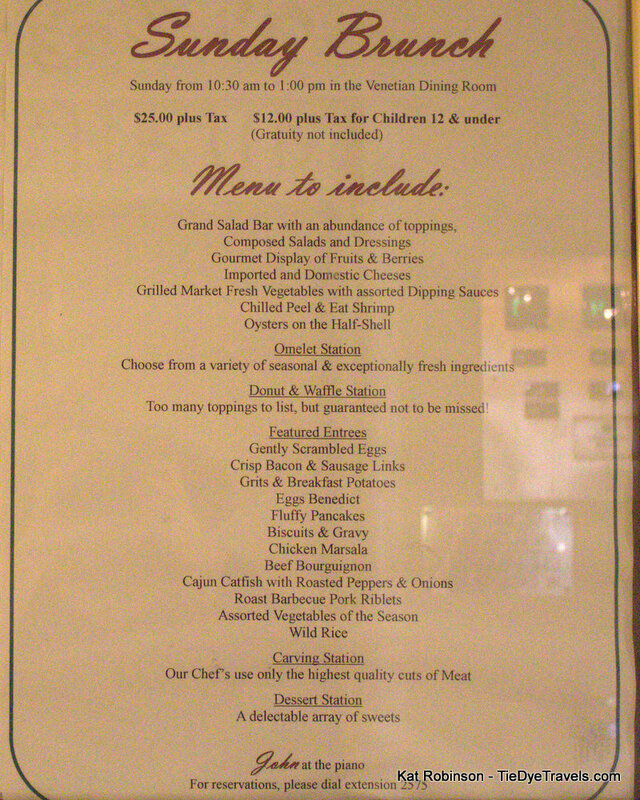 The Venetian Dining Room is the Arlington Hotel's formal dining room. The details within are exquisite. That ceiling... those chandeliers... that floor... wow. with the hotel on the current menu when you go. 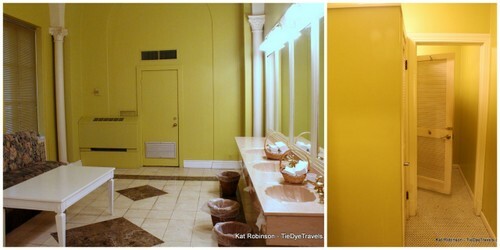 Even the restrooms are fancy. This is the interior of the ladies room by the Venetian Dining Room. The hotel elevators date to 1969. They are gorgeous. comfortable space for relaxing when there's not a function going on. at Garvan Woodland Gardens with a reception at the Arlington. 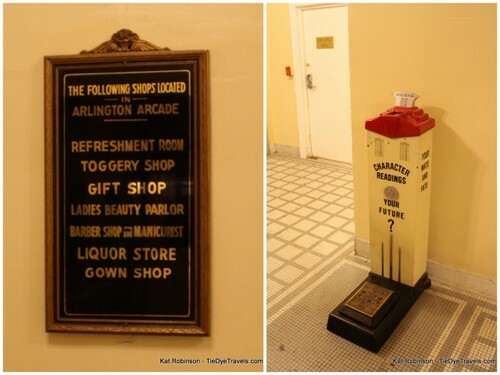 The Arlington Hotel has an Exhibit Hall and a Crystal Ballroom, both of which are gorgeous. elaborate but they're recently updated (which is why I don't have photos to share, yet). a massage or taking one of the famed thermal baths. 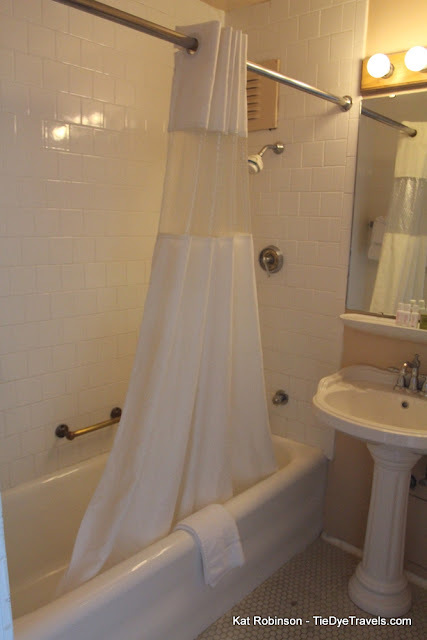 You can really go retro with a bath in one of those original tubs or a nice steam closet treatment! Don't worry, there's plenty of privacy. of those ladies. Mens and ladies sections are separate. Learn more about the Arlington Hotel Spa here. The spa is, of course, for the adults. What I'm about to show next is for the kid... in all of us. There are few other places you can experience a double decker swimming pool in Arkansas! Especially with a view of the Hot Springs Mountain Tower! The lower pool is shallow, and you'll often find kids playing there. Above it, a deeper pool sits within a curve of the mountain. My daughter (in the pink suit) is all about that lower pool right now. And don't worry -- one is above the other, but not right above the other. room and use the ones on the deck, please. our room back during Spring Break. Want to see our accommodations? and the magnolia decor in this room! I also love the view through the window. You can see right down the street. And it's gorgeous at night. 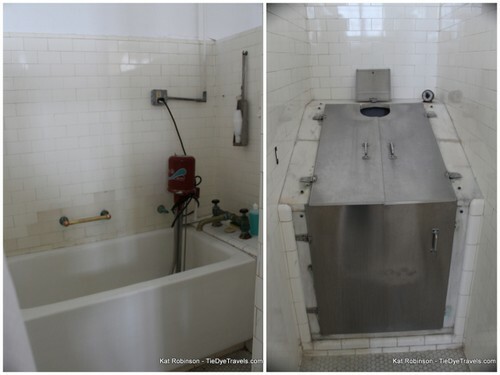 I also love the old tubs in the bathrooms. a bedroom with a king sized bed! Down in the lower level, there are a number of shops, including this neat retro beauty shop. There are also gift shops and clothing shops, as well as an exercise room. And you can get just about any sundry you need inside this shop. 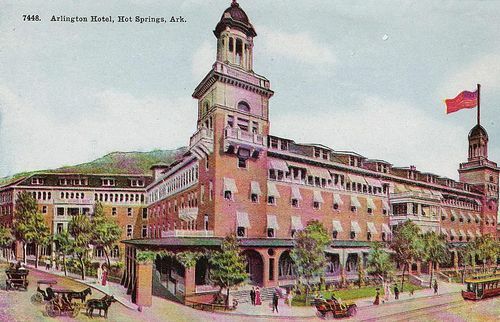 If you'd like more information about the historic Arlington Hotel in downtown Hot Springs, call 800-643-1502 or check out the hotel's website. Take a tour of historic Hot Springs Bathhouse Row by visiting OnlyInArk.com, or tour the Fordyce Bathhouse from top to bottom on the Tie Dye Travels blog here. 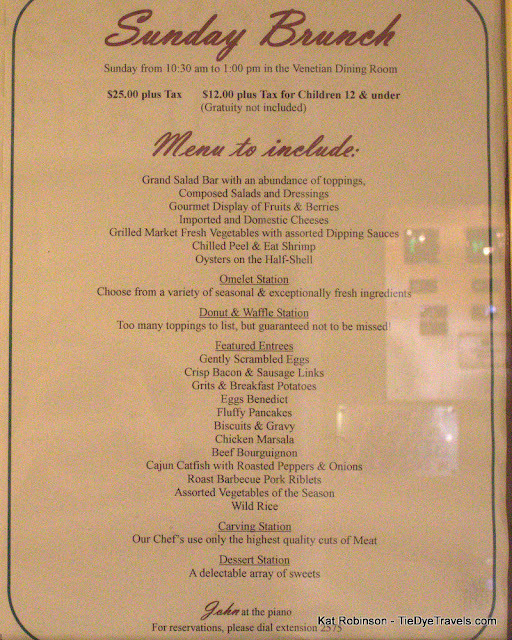 And for breakfast, consider crossing the street for a meal at the world famous, 75 year old standard The Pancake Shop. Crucial information about the actual Good-Quick responses in order to requests website comparing hotel prices, as advertised. Inexpensive resort reserving tougher to come by nowadays, it appears. Well-organized associated with I really like dealing with them because their employees are just about all friendly as well as educated.